We have a NEW BANNER design, and it is almost ready for the big reveal! Stay tuned for the official first peak! We want to apologize for the lack of updates this season - we took the year off from breeding and haven't been hatching out any babies, however, we will be breeding again next season! We are proud to announce that our NEW business cards have arrived! Keep your eyes peeled for them at upcoming shows! Our good friend at Emily Burke Artwork is the amazing artist that designed these for us! You can check her out on Facebook: Emily Burke Artwork on Facebook Emily is also working on creating a new banner design for us, so our "brand" will soon be changing, but for the better! We are extremely happy with how this past season turned out! Here are some of our favorite hatchlings, enjoy! And we can't forget our newest addition....meet our male Moro leachianus, Grover! Here are some of our hatchlings from the season so far! The incubator is starting to fill up! We can't wait to see what our pairs are going to produce for us this year! Here is one of our most recent additions! Introducing: Wadjet! She's a female pure Nuu Ana leachianus. We took some photos of some of our up and coming females, gaining weight and getting ready for the 2014 season! Xanadu, Snapdragon, Baneberry and Milkweed! Playing in the gecko room last night we came across this little stunner! Briar/Bracken #8 is going to stick around for awhile I think! We only have a few more eggs waiting to hatch, but we DO have some 2013 hatchlings growing up and showing their true colors! Here are two of our favorites, from our Briar/Bracken pairing! We've had lots of hatchlings in the past few months, and we still have eggs incubating, so even though the fall and winter is not our breeding season, we will have babies popping out well into December! Here are a few hatchlings that have arrived at Sticky Feet Reptiles recently. We had a very good day here at Sticky Feet Reptiles! Friends of ours, who happen to be customers as well, were able to swing by to pick up their latest addition (Sassafras!) and see our collection. We were very happy to have them, and hope they enjoy their new pet! Also, more hatchlings!! Here are the most recent hatchlings from the last few weeks. First hatchling out of Briar/Bracken has arrived! Our first hatchlings of the year have arrived! These two cute kids are out of our Reed x Fanta pairing. They incubated 99 days, and both weighed in at 1.6 grams. 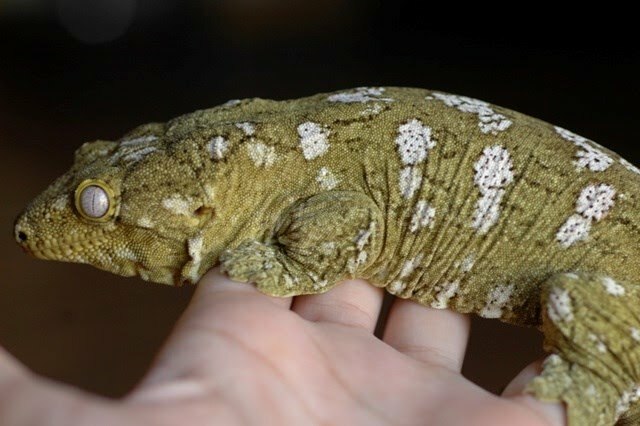 Geckos added to the sale page! The available geckos page will be updated soon! Things have started to get busy around here with our females starting to lay eggs, and with us preparing for all the hatchlings we will have in a few months! The gecko room has been reorganized, and there's more space for tanks and tubs now! Due to some recent instances of our photographs being used without our permission, and without credit being given, we have temporarily removed most of the photos from the site. We will be replacing them shortly, so bear with us!! Fanta has now been paired with Jarrah, and Bracken with Delphinium! A few days ago we paired up visiting Fanta with Reed, Mandrake with Nightshade, and Bracken with Briar! So far all the gecko pairs are getting along, and will be together for a few more days before being separated to give the males a rest before they are placed with their next female. A new year brings new excitement at Sticky Feet Reptiles! We can't wait to start this breeding season, and hope you're as excited as we are! We updated the "Our Collection" page with new photos and our 2013 pairings, and will be (hopefully!) getting some better lighting setup for our photos so you can see how beautiful these animals really are! New photos have been taken of ALL the geckos and will be posted shortly!! Check out the photo gallery too! Lots has been happening at Sticky Feet Reptiles!! We are finally preparing to move, after a unexpected delay, and will be moving in the next few weeks, so things will be crazy around here with babies hatching, eggs being laid, and everyone being transferred to the new 'digs!! Thirteen fertile eggs and counting! Looking for our newest addition Bergamont to lay a set sometime in the next few weeks! The egg count is up to 10 and the geckos are loving the warmer weather here in PA! Our big move will happen sometime mid-May, so we are busy preparing for that, and are looking forward to a bigger reptile room, and building a lightbox! Sorry for the lack of recent updates! Sticky Feet reptiles will soon be moving to a new location (also in PA) in about a month or so, so things have been very busy with the house buying process and egg laying going on! We currently have 6 eggs, two each from Venus/Mandrake, Maple/Mandrake, and Tigerlily/Aldair. Cayenne and Oliander are both digging and are expected to be laying soon! This is very good news for these two girls as our star super dal male Durian had to recently have one hemipene amputated due to a prolapse. A few more pairs have been put together, and we are anxiously awaiting potential eggs! The gecko room is always being updated and improved upon...a new labeling system was put into place today, to make keeping track of geckos, their weights, and breeding records much easier! Mandrake has been paired up with Venus, and with Maple so far this season! We're hoping for some fertile eggs in about a month! Nightshade still has a few grams to gain before we will put her in for breeding, so look forward to updates on her in the coming weeks! Tomorrow night we will be pairing up some of our dalmations, and black and creams! We decided the gecko room needed a renovation to make some extra space for growing geckos, and anticipated hatchlings. We are adding more shelves, and moving things around a bit, and will be posting updated photos soon! We attended the White Plains Reptile Show this weekend, and were excited to meet several fellow breeders we have had contact with online. It was nice to put faces to names, and to "talk shop" a bit! ALSO: The website has been updated! We have added a photo gallery, links, and have a basic care sheet posted. The 2012 breeding season is almost here! We are very excited for our anticipated pairings, and can't wait to have those eggs in the incubator!! Sticky Feet Reptiles website is created, and the business is just getting off the ground! Can't wait to see what 2012 brings!